Is the College easy to find? Yes, the college is in Central London (Zone 1) and very close to Aldgate tube station. Take a look at our maps to help you – and if you have any problems, give us a call on 0207 221 6665. Can I use the Internet at the college? Yes, free unlimited fibre optic Internet access is available to all our students at the college and in our residences. What self-study facilities are there? Each student is given access to our e-learning platform where they can practise grammar, vocabulary and all of the skills. The membership lasts for one year. Can I buy food and drink at the college? There is a cafe for students where they can buy hot and cold drinks as well as light snacks. Do I need to take a placement test to see which class I should be in? With your final booking confirmation you will be sent a link to our online grammar and vocabulary placement test. If you are unable to do the test online, you can do the test when you arrive at the college. On your first day you will be given a short writing test and you have an oral interview where your spoken English will be tested. 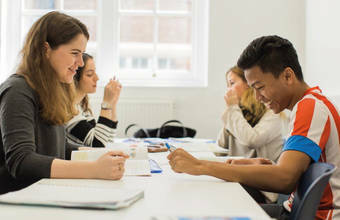 Once we have the results of the grammar and vocabulary test and the feedback from the oral interview, we will assess which level is right for you. You will need to bring your passport. What time does KAE open and close? The reception is open from 9am – 5pm. Can I come in for a trial lesson? Can I take holidays if I am a long-term student? Yes you can, but make sure you tell the School Manager in advance. You can take up to 4 weeks' holiday if you are enrolled on a 36 week course. You can borrow books from our Book Club on Wednesdays. 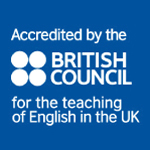 We have books for learners of all levels.This is a great opportunity to improve your reading skills in English. 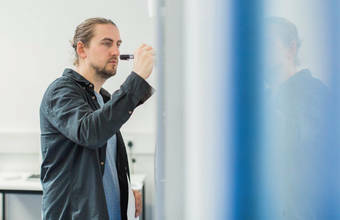 Students can choose to study either a short course for a minimum of one week, or a longer course for anything up to one year or more. 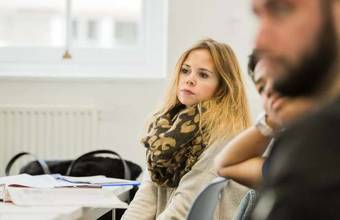 Is there a difference between General English morning and afternoon classes? 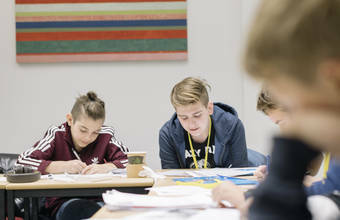 The aims of the morning and afternoon classes are different.In the morning classes you focus on grammar and vocabulary using a course book which also helps to develop your reading, writing, listening and speaking skills as well. Do I need to buy a book? 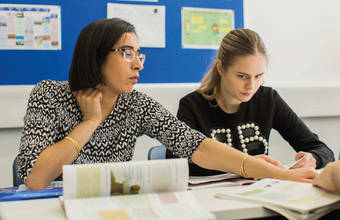 All new students on full-time English courses qualify for one free course book when paying the registration fee.If a student changes level, they will need to buy a new course book. The cost of a course book at KAE is £25. The maximum number of students that we can have in a class is 15. However, in the year the average number of students that we have in the classes is 10. Our students are from all over the world. Every year we have students from more than 50 nationalities studying at KAE. So, you will have plenty of opportunities to practise English with new international friends. See the pie chart on the homepage for more details about the top 20 nationalities that study with us. Students are given homework daily. What happens if I want to change level? How can I check my progress? Your weekly test results will show you both the areas you have improved on and the possible areas that you may need to review. What exam preparation does the College offer? 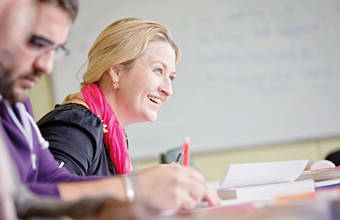 The College offers exam preparation courses for IELTS, Trinity, C1 Advanced (CAE) and B2 First (FCE). We are not an examination centre but we can help you to book an exam in an examination centre. However, we cannot guarantee availability. How do I decide what accommodation is best for me? Most of our students stay in the college residences. These are great places to meet other students and are very central. However, some students prefer to stay in a homestay to find out more about English culture and to practise their English. Please contact us if you want help in deciding which type of accommodation is right for you. What happens if I have a problem with the accommodation? You should talk to the Accommodation Officer. Once we know about the problem, we will try and resolve it. If it is not possible to work out the issue, we will arrange for you to be moved as soon as possible. All of our residences are self-catering, so you can use the shared kitchens to prepare meals. At the college there is a canteen offering light meals and snacks. How far are the homestay providers from the College? Most of our homestay providers are within a 30-40 minute journey from the college by public transport. You will need a letter from the college confirming that you have booked the course. 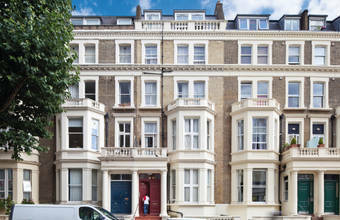 You will need information on your accommodation in London. You must be enrolled on a course of a minimum of 15 hours per week. 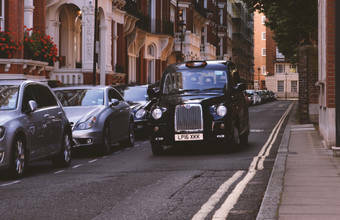 You must be able to show that you have enough money to pay for your studies and be able to support yourself in London. Speak to your local British Embassy for more information. What happens if my visa is refused? If your visa application is refused, you will need to send us the original documentation confirming the refusal. 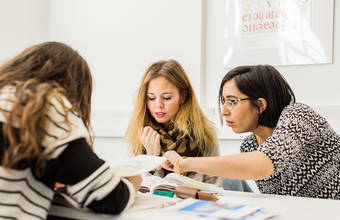 We can then refund your course fees minus £100, which is the college’s administration charge. Please see our TERMS AND CONDITIONS PAGE for further information. Will someone meet me at the airport when I arrive? Yes, if you have booked an airport transfer. For price details please see our price list or contact us. However, you may prefer to take the tube or an airport bus, which is of course cheaper. Do I need to register with the police? Some students will get a stamp asking them to register with the police at immigration. If you receive this stamp, please come to the reception and we will help you. There is also information about registering in our student handbook which will be given to you on the first day of your course. Can I get a student travel card? Yes, if your course is longer than 14 weeks. You can apply for a student travel card through the TFL website. Our Admissions Officer in the reception can help you with this. It costs £25 to apply for a student travel card. With the student Oyster card you can receive 30% off travel in London. Will I be able to open a bank account? Yes, if you are a long-term student. To open a bank account you will need a letter from the school, your passport, proof of your address and details of your bank at home. If you have problems opening an account, our International Student Welfare Officer, Terry Kwok, will be happy to help. If you are studying for 6 months or more, you should register with a doctor near where you live as soon as you arrive in London. This makes it easy to see a doctor whenever you are ill. Please see the student handbook for details. If you are not registered you can still receive treatment – at a hospital in an emergency, or at an NHS Walk-in Centre. If you are unsure what to do, please ask at the reception. WE ADVISE YOU TO TAKE OUT MEDICAL INSURANCE BEFORE TRAVELLING. KAE strongly advises all students to organise their own travel and medical insurance. Will I be able to work in London? Yes, if you are an EU citizen, you can work as many hours as you like. If you are studying on a student visa, you are not permitted to work in the UK. If you are not sure whether you are allowed to work or not, please check with the college reception. Can I use my mobile phone in the UK? Yes, but make sure you speak to your service provider for more information. It will be very expensive to use your phone in the UK so for longer-term students we would recommend that you buy a pay-as-you-go SIM card here. The weather in Britain is very changeable so whenever you come, it is sensible to bring a variety of different clothes – and an umbrella! In the winter (December-February) it is very cold and you should bring lots of warm clothes including hats and scarves. Summer (June-August) can be variable with average temperatures of 17-21 degrees Celsius. You will need a light jacket and some sweaters. Temperatures can rise to over 30 degrees Celsius though, so remember your sunscreen! Spring (March-May) and autumn (September-November) have average temperatures of 10-15 degrees Celsius, but again can be variable, so make sure you bring some warm clothes. Please check the weather forecast regularly while you are here so that you will know what to wear. I’m new in London. How can I make friends at KAE? Talk to other students from your class in the canteen at break times. Take part in excursions and activities. Ask the KAE Administrators to introduce you to other students. What social activities do you organise? 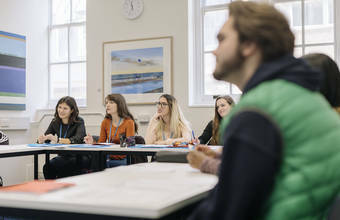 We arrange a varied social programme including trips to famous London attractions as well as less well-known parts of the city.These excursions are designed to help our students make friends and practise their speaking skills. We also organise weekend excursions, which we thoroughly recommend.These run to places of interest around the UK, including Bath, Stonehenge, Oxford, Cambridge and Stratford. Please see our main noticeboard outside of the classrooms or visit our Student Life page. It is easy to enrol on one of our courses. You can enrol online by clicking ‘Enrol’ for an individual booking. For group bookings you will need to email us and explain your circumstances: Our email address is info@kensingtonacademy.com. To confirm and secure your place you will need to pay a deposit for a course lasting more than 4 weeks, or the full fees for a course of 4 weeks or less. The deposit varies please contact us for details. The balance of your fees will be due on the first day of your course. You can pay the fees either by credit card, cheque or bank transfer. Please note that there is a 2% supplement for credit card payments and that cheques must be in Pounds Sterling and payable to David Game College. To pay by credit card please contact us to request an authorisation form. Do I need to pay in full before I receive a school acceptance letter? Yes, if you need a visa, we will issue an acceptance letter after you have paid the fees in full. For a one-year course, fees may be paid in two instalments. The balance of your fees will be due on the first day of your course. You may prefer to pay the full fees in advance if you need a visa. In this case, we will state this on your acceptance letter. Students can join classes on any Monday. (Except Bank Holidays – where begin on a Tuesday). To reserve a place in accommodation you will need to pay a £200 deposit. We will then send details of your accommodation. The accommodation rent can be paid in full on arrival or monthly in advance. The £200 deposit is refunded to you on leaving the accommodation minus any charge for damage you may have caused. 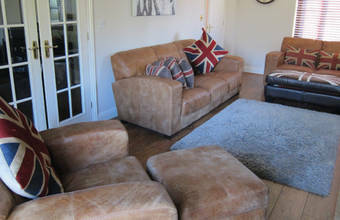 To reserve Homestay accommodation you will also need to pay the College a £200 deposit, as above. Ready to enrol? Click this link.